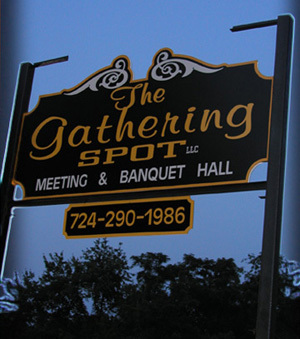 The Gathering Spot was developed with you in mind. A cozy, yet classy, event hall that is right-sized for under 50 guests. Options include rental of the hall plus many amenity choices. For example, why serve your guests their banquet meal on plastic tableware when you can rent fine china or vintage crystal along with a selection of beautiful centerpieces… plus everything else you need to make your event a total success. Located just outside of Butler, PA on Route 68, this banquet and event hall is convenient for the residents of Butler, East Butler, Chicora, Karns City, Petrolia as well as East Brady, PA and surrounding areas. Take the stress out of your next event, let us do the work. We are certain to make your special occasion a wonderful memory! Please browse our rental options, picture gallery and contact us soon to get a date into our calendar or to personally tour The Gathering Spot.